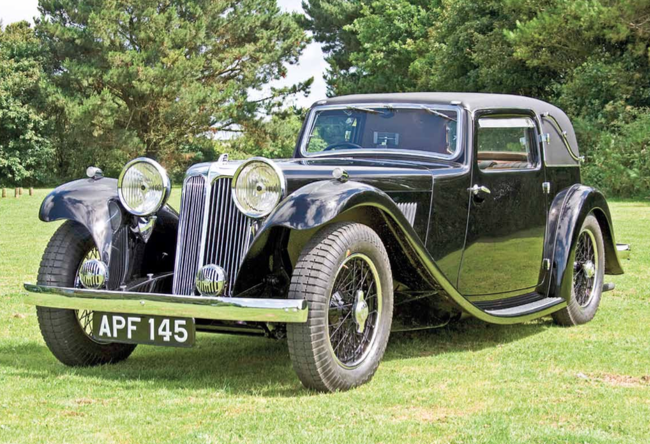 Designed by the Standard Swallow Coach Building Company (precursor to Jaguar) on a chassis and engine built by the Standard Motor Company, the SS1 wowed the crowds and quickly established itself as a vehicle with the glamour of an Alvis or a Bentley but at much lower cost. it debuted as a coupé, but several different body styles were quickly added to the line-up. Manufactured on 13 February 1933, this particular SS1 was then dispatched to Henly’s Ltd in london on 15 April where it was purchased by a Mr E M Bowden . Four years later it was sold to Betty Foley of Portsmouth, who is cousin to the present owner Michael Jewell. Betty used the SS1 regularly until 1963 when, after it had been stored in her garage for ten years, Michael bought it from her for £325. He dry-stored it until March 2001 when he decided to have it totally restored. It was transported to Wildae Restorations of Braunton in North Devon, where it was stripped to the last nut and bolt and painstakingly rebuilt to concours condition over eight years. It was brought home in the late summer of 2009 and has won several events – including the Jaguar Drivers’ Club SS concours in 2010, 2011, 2012 and 2015. It has since been barred to give other owners a chance. It has also been exhibited at NEC classic car shows and it took part in last year’s Concours of Elegance held at Edinburgh’s Palace of Holyroodhouse, where it won both the RAC club trophy and the inaugural Jaguar Trophy.